Contenders can download RPSC Assistant Engineer Prelims Admit Card 2018-2019 through this article. The higher officials of Rajasthan Public Service Commission are planning to release the admit card in the Forthcoming Months. So, we advise all the candidates to wait for few more months to download the admit card. The RPSC did not release the exam dates. As soon as, it declared the exam dates on the official web portal we will update you in this article. Hence, stay tuned to this post for the latest news. Also, we are providing you with the active links in this article to download the admit card quickly by redirecting to the official website. Contenders who haven’t applied for the RPSC Assistant Prelims Exam 2018 can apply by 29th May 2018. So, aspirants those who are willing to attend the RPSC Assistant Engineer Prelims Test 2018 can download this admit card. The higher officials of Rajasthan Public Service Commission will release the results on its official web portal @ rpsc.rajasthan.gov.in. Download Rajasthan PSC AE Hall Ticket 2018 through the links that we are providing ou at the bottom of the article. As soon as, you click on the links, you can quickly redirect to the official website, and from there you can download the admit card in the form of PDF for free of cost. This year the Rajasthan Public Service Commission is hiring the aspirants for 916 posts. So, willing candidates can download this admit card from the links that we are providing you in this article. 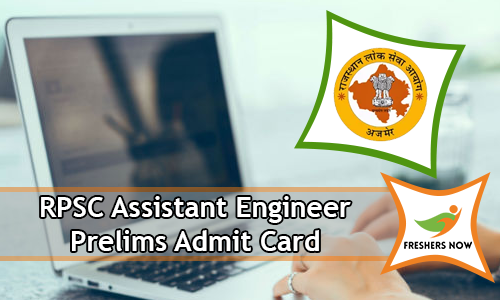 After downloading the RPSC Assistant Engineer Prelims Admit Card 2018-2019, aspirants have to check the details present on the admit card. These details include the Applicant’s name, Father’s name, Mother’s name, Photograph, Signature, Exam code, Exam Center, Date of the exam, Timings of the exam, etc. Regarding any mistakes, aspirants have to contact the higher officials through the mail quickly. Moreover, candidates should carry the PAN Card/ Voter id/ Adhaar Card/ 10th class marks list/ Driving License, etc. So, without these aspirants will not be allowed into the exam hall. Hence, we advise all the candidates to cross-check the certificates that you have to carry to the exam hall to attend the exam. The RPSC Assistant Engineer Prelims Exam Pattern 2018-2019 is available in this section in a table format as well as bullet format. Prelims Exam contains Two Sections. And, Section A is a compulsory Paper of General knowledge & General Science including General knowledge of Rajasthan its Geography, Economy, and Culture subjects. Also, Section B is an Optional Subjects. Candidates will complete each paper within 2hrs Time Duration. Each section carries 200 Marks. Optional Subjects Names: Civil Engineering, Mechanical Engineering, Electrical Engineering, and Agricultural Engineering. So, aspirants have to keep visiting this article for latest updates. And, we suggest the candidates, attend the online mock tests for time management skills, which are essential to qualify any written tests. The candidates will face three levels of the selection process. The first round is a Preliminary Examination, the second round is a Mains Examination, and the third round is a Personality and Viva Voice. Therefore, applicants, first of all, clear the Prelims Exam with minimum qualifying marks then they will go for the second level of the selection process. In this way, candidates will complete all the levels; then they will get the job in Rajasthan Public Service Commission. Finally, we suggest that applicants can prepare well for the Prelims Exam because Prelims Exam is the first qualifying test to get the job in Rajasthan Public Service Commission. From the upcoming sections check the details about the steps to download the admit card and links that we are providing below. Now search for RPSC Assistant Engineer Prelims Admit Card 2018-2019 link in the search engine. After finding out the exact link, give a right click on it. Nextly, enter the hall ticket number and password that have mailed to you during the registration process. If the admit card does not appear on the screen then the hall ticket you have entered is wrong. Cross check the details twice. Check the details printed on the admit card. Download the admit card in the form of PDF for free of cost.